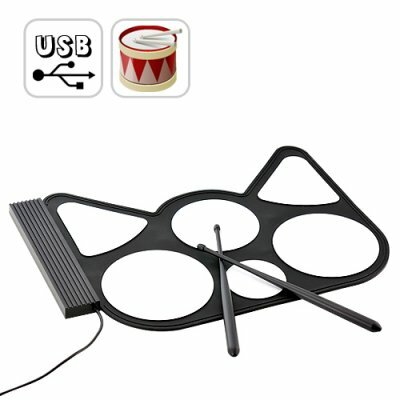 Successfully Added USB Roll-Up Drum Kit - Cool Gadget to your Shopping Cart. This USB roll-up drum kit can be place on any flat surface, play the drums with the included drum sticks or simply use your hands and practice the bongos, either way, this USB drum kit will provide endless joy for people of all ages. The benefit of such a cool gadget is its unique design that allows it to be played without having to disturb the whole neighborhood with loud drum beats. Once you install the included user friendly software, you can then start practicing your drum solos, juts use your favorite headset and listen to your beats while you play. Unless, you really want to wake up the neighborhood, then just crank up the volume and let your surround sound speakers do the rest. This digital drum kit is perfect for beginners who are interested in learning how to play the drums, the included software application supports WAV format audio files that can be played along with, as well as record your own drums beats and share with friends and family via e-mail. This portable USB drum kit can be taken with you anywhere thanks to its flexible and light weight design. Available in our warehouse right now, click "Add to Cart" now, and we'll express ship it tomorrow. As always, this great drop ship and resale gadget is brought to you by the number one provider in factory direct consumer electronics - Chinavasion. - Panel Function - Play/Stop/Record/Program//Open/Save. Will this USB drum kit work on my Windows 7 computer? Yes, this USB drum kit will work on Windows, 2000, XP, Vista and Windows 7.